At the Associated Press, aka the Admininstration's Press, reporter Jim Kuhnhenn predictably and dutifully reported that President Barack Obama "reiterated his vow not to negotiate with Republicans over raising the borrowing limit." 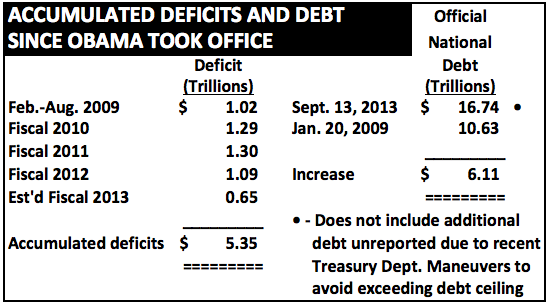 As I noted elsewhere today, since Barack Obama was first inaugurated, the government has run budget deficits totaling $5.3 trillion (assuming the fiscal 2013 comes in at "only" $645 billion; barring accounting maneuvers, I believe it will come in at over $700 billion), and increased the national debt by over $6.1 trillion (plus the unreported debt which has been incurred during the past month or so as the Treasury Department has engaged in money-shifting to avoid exceeding the debt ceiling). If running a $248 billion deficit in fiscal 2006 was "reckless," what adjective remains to describe running deficits over four times as large for four straight years?